The Edmonton Oilers have been an interesting team to follow from afar. The architect changes almost annually and they never seem any closer to breaking ground. High profile changes like those are easy enough to follow. Keeping track of lower level transitions, from one coach to another, presents an entirely different set of circumstances. Particularly when looking at the systems that have come and gone. Small tweaks here or there in the offensive and defensive zone stick out eventually. Patterns reveal themselves and one can develop a solid enough grasp of the ins and outs. When the pace picks up between those two zones, though, the challenges are ten-fold. There’s so much noise that even several games later you’re still losing track of the signal. Don’t get fooled into thinking this makes the neutral zone any less important. The opposite is true. It’s just more difficult to catalog with our mind’s eye. That’s why I embarked on a neutral zone project, centered around tracking zone entries, at the beginning of the season. The hope was to cover all thousand-plus games in the season. I’ve taken a step back and am now hoping to get to twenty games per team. In the meantime, I’m twelve games into the Oilers and have results to share. Just so we’re clear, a controlled entry is one where the puck is either carried or passed into the offensive zone. An uncontrolled entry is one where the puck is dumped in or brought in by way of firesale at the blue line. A failed entry accounts for when either of these fail. There’s some level of interpretation involved, but generally speaking it’s an objective set of metrics. Taylor Hall cleans up by all three measures – controlled entries, uncontrolled entries and failed entries alike. In fact, Hall is in a world of his own. Neutral zone success is driven heavily by speed, so this shouldn’t be overly surprising. What’s especially impressive though is that Hall is towing a 57% controlled entry rate, indicating a high-quality of play between the neutral zones as much as volume. It’s hard to recognize as much looking at the raw totals, but Connor McDavid isn’t far behind Hall. That’s more a byproduct of time lost to injury than anything else. McDavid’s entering the zone with control on 73% of his entries while only failing to convert on 15% of his attempts as a whole. Young players are supposed to struggle with possession. Neutral zone success drives possession totals. I think McDavid is bucking the trend. If neutral zone data has any one blind spot, it’s probably defencemen. Zone exits can pick up some of the slack, but I just don’t have that base covered. In the meantime, I would avoid being overly concerned with their modest showing by these three metrics. McDavid and Hall are, again, way ahead of the pack. There’s a chasm between them and the next best regular skaters. Hall especially, who’s entry rates in their totality are four-plus ahead of any skater other than Zack Kassian, who’s numbers could very well be muddied by sampling issues. Speaking from experience, I got the sense Benoit Pouliot’s pedestrian results might catch people off guard. Neutral zone success goes a long way in driving shot metrics. Pouliot is continuing to drive possession, in spite of being a transition anchor in the games I’ve sampled. I’m looking forward to revisiting this another seven games down the road. On the opposite end of that spectrum, I was pleasantly surprised by how well Oesterle shows. Have to temper the optimism with the reminder it’s an 18.4 minute sample, but those results are worth getting encouraged by all the same. Just to clarify, when I say ‘shot’ data, it’s actually Fenwick data – unblocked shot attempts. Try not to get to carried away in either direction by some of these results. I’ve less than ten minutes for a few of these players, so try to keep that in mind. Jordan Eberle, who’s always carried a high leverage role with the Oilers, is working his way into the conversation as a high-end transition player. His skills are marked by an ability to turn entries into shots. Eberle’s 21 Shots/60 from Entries is 3.5 higher than the next best Oiler. 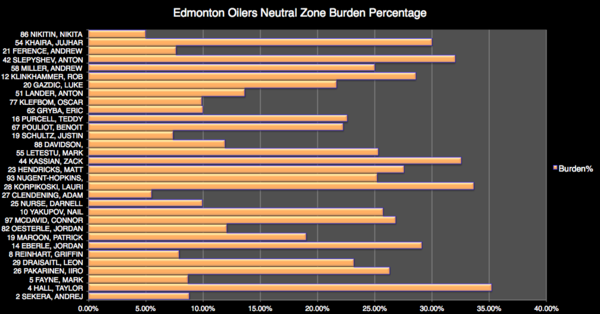 Neutral zone burden percentage (NZB%) attempts to take the guesswork out of which players are driving play. If a player is accountable for five of ten on-ice entries, that player was burdened with 50% of the team’s entries with him on the ice. So, if Hall has an NZB% of 35.2%, then he’s accountable for just over a third of his team’s on-ice entries. That’s a really high number, but it isn’t necessarily miles ahead of the pack. If you’ve been waiting for a redeeming quality to show itself in Lauri Korpikoski’s game, look no further. Korpikoski’s 33.65 NZB% indicates he’s doing much of the legwork in the bottom-six as far as transitioning play is concerned. You really get a feel for the speed of the game when observing it through the lens of neutral zone data. The Oilers themselves account for just more than an entry a minute. Take into account the opposition and you’re awfully close to two per minute. The Oilers enter the offensive zone with control nearly 40% of the time. There’s a large cluster of teams in that neighbourhood, so it’s hardly a concerning mark. In a perfect world, they’d even out that ratio but that’s neither here nor there. Edmonton has a lot of speed at the top end of their lineup. If they can bring more into the fold at the bottom of their lineup, one would expect a better controlled entry ratio to follow. Controlled entries are known to produce twice as many shots as uncontrolled entries, so it’s an end worth chasing. I am the same way sometimes. On the other hand we all know how “Saw him good” has moved the Oilers forward in the last ten years. I agree, but I think it was more a matter of employing scouts who weren’t actually properly trained professionals in their field who just did a careless, lazy job of evaluating talent. Seen a couple of interesting analytical pieces recently particularly regarding Yak. This plus Staples had an article at Cult of Hockey regarding scoring chance +/-. On the scoring chance +/- table Yak was 3rd or 4th on the team and actually made fewer mistakes on chances against than ON favorite Hendricks. 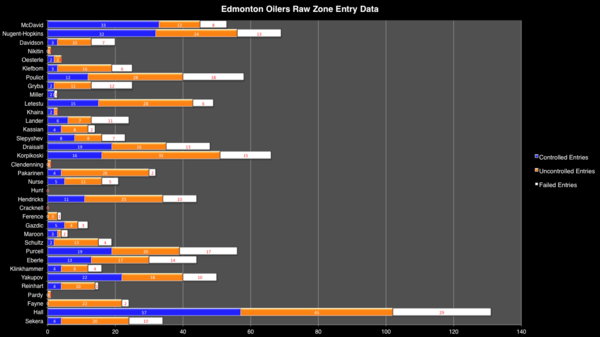 Here he shows fairly well on the zone entry charts ahead of guys like Ebs and Drai. The strange part of these numbers is why the zone entries result in so few shots. Is it the lack of quality linemates he has often been saddled with or is the idea that he is an offensive talent a mirage based only on draft position. I would think it has to do with Yaks unwillingness to get the puck deep in the O zone. He crosses the blue line and stops. Once stopped the D attacks him and possession is lost or comes out of the zone. I have no data to back it up but my believe is that Yak skates and carries the puck well. This is why his zone entry numbers look favorable. The issue with Yak is he doesn’t work well with his line mates. He grabs the puck and then doesn’t give it up until he is out of options. This almost always results in a low percentage shot or more likely, a loss of possession. This would explain the lack of shot totals. All while being chased by bees. I find that he looks nervous with the puck and wants to get it off his stick ASAP and makes poor decisions as a result. The NHL is the fastest league in the world and usually moving the puck quickly is a positive. In Yak’s case, by my eye, he gets rid of the puck rather than moving it into a better position. More important than zone entry – is o zone possession and generating quality shots off of it. Oilers live too much off of the rush and tend to turn the puck over too much. When you have a quality possession (time, speed, support) through the neutral zone, sure – take it over the blue line with possession and if its real good (like a high speed 3 on 3, or an odd man rush) make a play to the net. The problem with the Oilers in general, and in particular with Hall (Yak included) – is that there is a tendency to prematurely try to take just about any kind of possession (lacking in one or more of time, speed, support) to the net. The results are often a shot that may get to net with little chance of going in or generating a rebound and or turnovers that end up quickly going the other way through the neutral zone. One (rush) and done (it’s going the other way). The Oilers have brought in guys like Kassian and Maroon for a reason, which is to be more selective on the rush. When the quality of the possession is less than ideal through the neutral zone – if possible, maintain possession over the blue line and work the puck with support along the o zone boards – utilizing all 5 players. If possession isn’t possible or too risky – dump the puck to an area that can be pressured immediately and regain possession through a strong fore check – again working the puck along the o zone boards. It would be progress for Hall to have fewer zone entries and fewer shots off of a direct controlled entry. If – we evolved into a team that tended to move the puck north and tended to keep the puck north – more often. Hall has a lot of zone entries because it looks like a tennis match when he is out there. If Hall would really work with a guy like Maroon or Kassian and big Drai, we could be controlling more possession in the o zone – along the boards and being more patient about taking it to the net – only when something opens up. Everyone including the d (who could then get involved in the possession process), would get more touches (we wonder why our d have no points)and scoring would be more spread out. To use a basketball analogy – its like Hall commands possession over the center line and has no awareness for working the shot clock – using all of his team mates, by working the ball around the perimeter of the court. It’s not basketball – but if you have the right kind of horses (like Maroon / Kassian), there is a lot of potential benefit to be gained by lessening the dependence on rush and increasing the incidence of perimeter puck possession. I guess my point – there is more to the raw numbers than meets the eye. Its obvious that your perception of Hall does not match up with this data, and thus you are struggling to rationalize and make sense of this discrepancy. I encourage you to be more objective in your opinion and reassess based on this new information. You may discover an alternate perspective. OK – we’ll leave it at that. Go Hall Go!!! I totally get what you are saying here. To simplify it even more, I’ve been saying for a few years, the Oilers need some cycle players (Poo, Maroon, Kassian) without them they are just a rushing team. Which is Hall, Nuge and Ebs rushing up the ice, creating a scoring chance off a speedy rush, the goalie making a save, and the puck going back the other way. This does not mean they are bad players, or cant maintain possession, they just need to play with other players that do have that cycle skill set. Hall’s stats, to pick on him in particular, are a direct result of previous GM’s not building a team with at least some players that can cycle and maintain possession. This year with Leon growing as a player, and PC adding Kassian and Maroon, finally Hall has some players to help him win board battles and keep the puck. Remember people that Hall never plays with Poo, who until recently is the only puck possession player the Oilers have. Of course Hall’s possessions stats will suffer, he’s never been put into a position to play on a puck possession line. Anyway, I agree with what you are saying that there is definatley more to these numbers that what’s on the surface. Yes – players like Hall and Eberle need guys like Kassian and Maroon, but – when they have them in support – they need to modify their game accordingly. Hall says to himself – might as well keep up with my rushes, because no way we’re gonna be able to sustain o zone possession along the boards. Hall should say – hmmmm, maybe I got this Kassian guy for a reason. Maybe I shouldn’t always immediately take everything to the net, when we really don’t have much going on, that is likely to score. Maybe instead of this lame @ss pass I’m about to make into the middle, I’ll wrap it low to that Kassian guy. You know what? Drai is pretty big and so am I – maybe we can keep a cycle alive and even use our d men, to hold on this puck, so – maybe we can make a play together – every now and again. Geez – suddenly I’m more popular with my teammates. They like scoring and getting assists too. Imagine that? Holy my – plus minus is whole lot better too and we’re winning more game than we lose. Is it actually possible that this young man has been mis-used by one Oiler coach after another? Afterall, he was the consensus 1st overall the year he was drafted after being a superstar in the OHL. He is talented. He actually thrived under Krueger during his first year and looked like he might be a top goal scorer in the league. What would he be like now if Krueger had kept coaching him? We will never know due to one of MacT’s biggest mistakes ever. Krueger is a very bright guy, that’s why he’s been running a soccer team in the UK for the past several years. But Eakins et al have sapped every ounce of confidence out of Yakupov. It would serve the Oilers right, as an organization mismanaged from the owner on down, if they trade him for peanuts and he becomes a goal scorer for another team. I would think a guy who is going to be labelled as a top goal scorer in the league should be able to score 20 without much help from coaches or linemates. If all his confidence was sapped as a rookie by the likes of Dallas Eakins, who knows the effect it could have on a young player? The Oilers aren’t in 29th place again this year after a decade of futility by accident. That’s after drafting 1st overall four times and 3rd overall and 6th overall in the last six years. This team’s management has been a basket case forever. And still failure is the word with this organization. Why is it not possible that such a dysfunctional organization has not completely mis-handled and ruined a once promising young player?? I don’t think Yak has been handled well at all, but dude, he’s got SIX GOALS this year. He has to absorb some of the responsibility for that. You can’t blame that all on being saddled with Letestu. Letestu has more goals and he plays with Letestu 100% of the time. 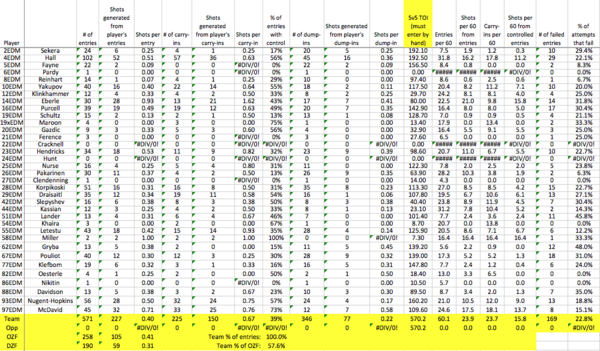 David Staples also uses “analytics” on his own made-up, arbitrary measurements (mistakes and contributions). It’s like doing a scientific study using data from a Harry Potter book. Often it turns out that the players he likes are pretty good by his metrics. I also think the reason the shot totals are low is because the Oil tend to pass up shots and have the passes defensed, and the play goes the other way. Also do unblocked shot attempts include the shots that miss the net? You need to work a bit more at turning data into information. Very cool project.. Well done! I think what these stats show us most is that Hall needs to learn to use his teammates more. Puckhogging and pouting habits aside, he’s a great talent. But how many times have we seen him turn the puck over because of him wanting to do everything himself and try to force a pass or a shot that just isn’t there? If he can learn to use his linemates more and recognize when to make a play and when to cut bait and dump the puck in, he will truly be one of the league’s elite players. However, depending on what PC does this offseason, that may not happen with the Oilers. You cant make someone into something they are not. This is who Hall is. Thats how he plays. If we want to maximize his talent you need to find him complimentary linemates. Then maybe they should try him at center, because he seems to think he is one. I’m sure coaching can get him playing a more line-oriented type game. He’s never had to do it before so now it’s just a learning process. (Once he admits it or realizes it, the process can begin). Just to clarify, I’m not necessarily in favor of trading Hall, because I think he’s a tremendous player, but if the right trade is there and it makes the team better, then why not? After all, we got McDavid!!! You are either a troll or really, really bad at reading. What these stats show is that Hall is excellent at bringing the puck onto the offensive zone, and excellent once it is inside the zone. Nice try though. I’m no troll and while Hall being good at zone entries may be true, it also shows that he has the puck way more often than his team mates do. And since the Oilers turn the puck over more than most teams do, I correlate it to players like Hall who possess the puck so much of the time. You see, I use common sense, and not just some unreliable stats to make up my opinions. That’s what people who think for themselves do, smart @ss! Typical comment from another hockey “fan” that thinks the game is played on paper. Giveaways correlate closely with high performance players. i.e. in order to have a lot of giveaways you have to have the puck a lot. Hall having a lot of giveaways means he has the puck a lot. Do overall team turnovers correlate with a bottom 5 team every year? Yes, I bet they do. Bottom line, we need a better mix of players on this team. I don’t know if that means moving Hall and I really don’t care, as long as the team is improved. But one thing I wouldn’t do if I was a GM, is rely on stats that are given in isolation, such as comparing one player to others on the same bad team. I thought we were talking about Hall. PS. You shouldn’t “bet they do” 5 minutes on google and you should be able to say they do or don’t. Now that I am at home and my boss isn’t expecting me to do some work, I took a half hour or so to look up team give away stats. the results listed below shows there is really no correlation at all between team success and team giveaways. Who would have thought. I think these stats show that Hall is a beast. He is best with players who are bad at zone entries, but good in the zone when possession is obtained (i.e. eberle). I’ll be at the game tonight!!!!!!! Having watched almost every game for years. Taylor Hall turns the puck over at the blueline way to often. Statistics can show anything you want 66% of people know that. I prefer to watch games live. Tv focuses your attention on what the camera is looking at. You miss a lot of what’s going on that way. On Pouliot’s numbers, I don’t have anything to back this up but I’ve always thought he makes nice little ‘go’ passes. Like the last have of a give and go. So they’ll be within the same zone. He amazes me sometimes with the neat little passes he does. I’m sorry, but all this stuff is meaningless to me. We watch games on the ice not in a math equation. When has this become acceptable journalism? Todd Mclellan said something along the lines of “the best test for a player is the eye test” and I agree. This isn’t hockey here. Just so you know, I cheersed ya. That being said, some of these advanced stats are useful for scouts to make decisions. But, it isn’t terribly interesting to many fans. If we relied on the eye test to make every decision, then we’d still, as a culture, be cavemen. To be fair though, its not us making the decisions. I have accepted that I’m just a dumb hockey fan, so I just use the eye test. For me, the whole essence of being a fan is WATCHING the games, not plotting their every move on a chart. fair enough. Hockey is big money. And big money needs accurate prediction algorithms to improve their business. Accurate prediction requires reliable statistics. Any blogger that writes something like this, is likely trying to get into the industry by getting their work out there, or they have another career where they do similar things but with boring data…like health, happiness, road congestion, or immigration statistics and just want to use their skills for something fun for a change. This stuff is for people who want to understand the game better. If you don’t, go away. Nothing wrong with the ignorance is bliss model of watching sports, but for those of us who want to delve deeper into the sport we love, comments like this add nothing to the discussion. Thanks for reading the title of an article that you knew you wouldn’t like, reading the article anyways, whereupon you discovered you did not in fact like it, and then posting a comment about how you didn’t like the the article. …does not indemnify you against criticism of dumb speech. Interesting read on a very important statistic. I look forward to seeing it when you are completely finished and compare to other teams. Whenever I see charts or the word Corsi I scroll to the next article. No offence, but surely there is an easier way to make your point. The only thing missing from this convoluted mess were a couple of charts in Hebrew. I do not see any figures for Draisaitl . E.Melnyk on puck daddy column has put entire team on notice they could be dealt including E.Karlson , as he states staying status quo will only produce same poor record for next season . This club is still putting up more wins than losses in comparison to our club . Did Edmonton do enough this season to change the basic status quo so team could move forward ? No , they did not , and coaching thus was stymied to get much better results out of players because of it . Our veterans are not doing much of a job moving team forward and should all be on high alert . 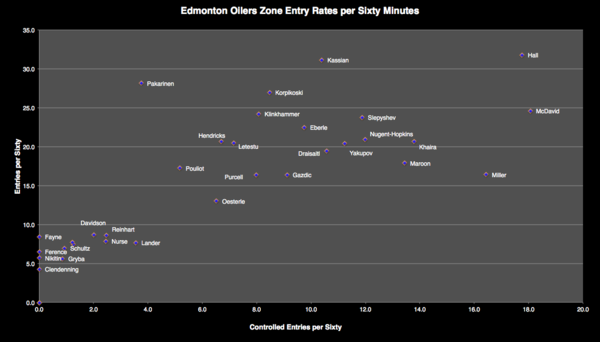 According to the is stat, yakupov is the best oiler at zone entries. Tells you how reliable stats can be. All these charts, numbers and fancy stats….I’m just going to sit here in the corner and play with my crayons. Interesting project. Without another team (or teams) to compare it to it is very limited; we’re left comparing players on a bad team to other players on the same bad team. This is interesting. Looking forward to a bigger sample though. 12 games seems awfully small. Makes you wonder a bit about a coach who loves to dump and chase bit also supposedly loves volume shooting. Based on this, it would seem the way to get high shot totals would be to carry the puck in and always have someone driving to the net looking for rebounds. I am a math guy, per say. However I’m not a corsi guy and not really all that trusting of over-use of statistics in sports. Baseball is the exception, where stats pretty much run the team, and it works. I don’t feel the same way about hockey. There is obviously a benefit to coaching/management in looking at stats. But you always have to take them with a grain of salt, especially in hockey. I bring you back to the Eakins era, where they were playing the worst hockey of the decade, yet somehow winning the corsi battle most nights. Anyway I’m all for coaches and GM’s confirming with their stats guys to check to see if their ‘eye test’ is in sync with the data. What I fear is determining the value of a player from a corsi chart. Then you end up signing Mark Fayne to a big contract just because he has a good corsi in NY. Man, ever look at Schultz, he always has decent possessions numbers even though he couldn’t play defense. I feel like I watch the same dog and pony show each night with Hall (other too, but let’s stick to Hall). Skate really fast into the zone and loose control of the puck (I don’t need a MIT or Harvard analytics dude to tell me that, but ok). As a whole there is no really no concerted attempt to manage the puck down low in the offensive zone – is the talent on the roster not able to? Nuge maybe the best puck manager on the team and that is a huge (no pun intended) problem. Players with puck management skills or PMS is what we need. When we see a stat that can captures Wagon taking a puck to the gonads shattering his can and coming back to play for his teammates or Smyth taking a puck to his teeth spewing Chiclets and coming back to score the winning goal. Well, until stats can measure intangibles like that I will take all stats with a grain of salt. The are a tool nothing more. ummm…yes. That’s exactly the point. Statistics is another tool. Every statistician will tell you that. I don’t understand what you are implying. Intangibles cannot be measured and they can dictate who wins hockey games. ok. So because we cant measure everything, we should measure nothing? If you pay close attention, no one is arguing that you are wrong. We are just talking about the things that we can actually quantify. Anything that has an effect can, by definition, be measured… Assuming one has the proper metric to do so. Statistics are for losers. Oooops that may be appropriate in this case. My least favourite stat is the sick bay numbers the oil have piled up. Yikes that hurts. My favourite stat is the deals that have made the Oilers a better team at the deadline. Assuming PC has the hammer in all deals his short tenure has shown a change of direction. He will get the benefit of another top 3 draft pick this year. He’s getting close, perhaps 2 d men and a goalie in summer deals. I have a pair for the Rexall Farewell. My prediction: I’m 100% stoked. Also, to everyone that says this is math, this is not math. This is no different from a guy sitting there counting hits, giveaways, takeaways, plus minus, GOALS or assists. This is just a guy that decided to count something new that is likely related to outcome and could potentially be used as another tool to help understand why our team is so awful. If you don’t like math, fine. But I should think that everyone is able to appreciate the benefits of counting things. Fascinating article. As you point out in the article this sample size is rather small so these number shouldn’t be relied on for much. Is there a process for knowing when you have a large enough sample size? Or, how would one know they have enough data to be confident in the readings?